This week was an especially tough one. The full moon and the tides produced currents that strained at the knees and tendons of these two built-for-comfort-not-speed-close-to-50-year-old divers. There was no predicting the currents either, except that they appeared to impede progress in any direction we wanted to go. When we did finally get to the Turtle House we generally found few turtles there. It seemed most preferred to stay under their ledges and in their depressions, venturing out only for air. Of the few turtles at the Turtle House, none were particularly active and so there was little to photograph or videotape. Most stuck low to the corals, faced into the current, and simply snoozed. An excursion for air meant they were swept downcurrent and had to make their way back to the Turtle House. Here is an example of what the turtles looked like as they spent their day in the river made by these currents. This is Nani. She lies at the bottom and faces the current, head hunched down, wearing a grumpy expression. Reminds us of how we look on any overcast November day in Canada. This is the kind of thing that happens when there is little current, the ocean is clear and clean, and the sun is shining. Turtles are similar to people as far as the weather goes. They are happiest and most active when the sun is shining and things are calm. At such wonderful times the visibility is excellent and the turtles get to see all the comings and goings. We have concluded the most interesting thing in the world for a turtle is another turtle. They are more social than many people give them credit for. 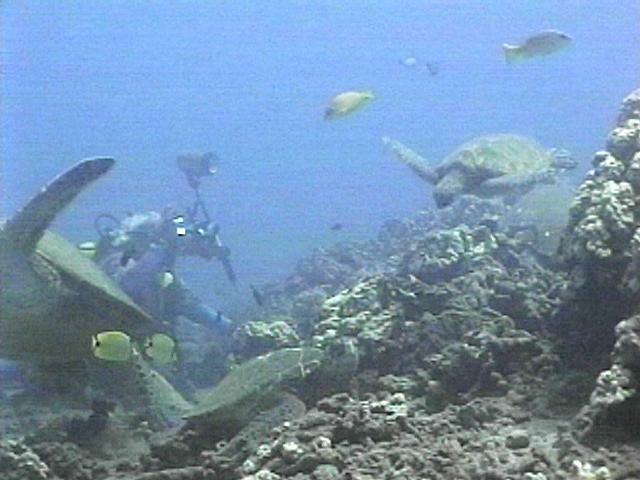 Turtles have a remarkable ability to see another turtle far off in the distance--well before these divers can see one. We have followed turtles as they swim and know this to be true. When they see another shell off in the distance, turtles will veer in that direction and initiate contact. Sometimes this is limited to one turtle merely skimming over the carapace of the other. At other times, there is actual physical contact with yawning (it's too slow to be called snapping) and butting (one turtle tucks head under the other's plastron and pushes). This is all quite brief and appears friendly, like a locker room hello and towel snap. We do not know if they recognize each other individually. We like to think they do. We have observed the same individuals resting beside each other in the same place over several seasons. Yes. We like to think they recognize each other. This is Zaphod. 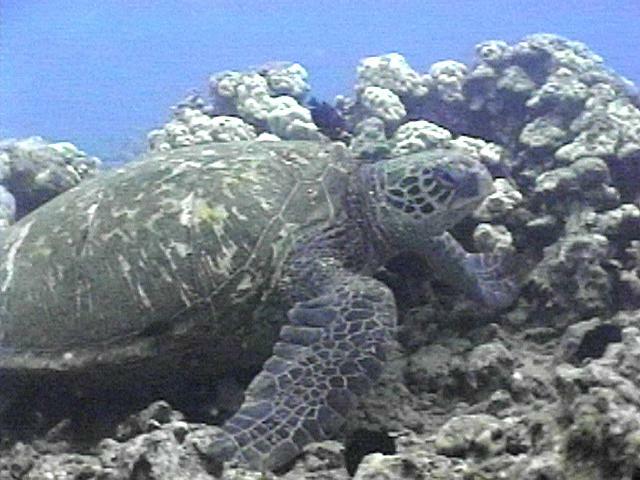 In 1992, we began seeing her almost every day at the same place at the Turtle House: at the bottom of the large coral mound, her head always tucked inside the hole there.. We called Zaphod after the character in the Douglas Adams Hitchhiker's Guide to the Galaxy series. Zaphod, you might recall, wore peril-sensitive sunglasses. Zaphod had tumors when we first met her back in 1992 and in the five seasons we've known her they really haven't gotten any worse. Zaphod has a special place in our hearts. For whatever reason, she has chosen to spend her days in exactly the same place, her head tucked under a coral ledge. We have speculated what is so fascinating under there. Certainly there must be plenty of action with all the soldier fish that are Zaphod's constant companions. Sometimes when there is little happening, we rest beside her and just watch. Her world is beautiful and peaceful. 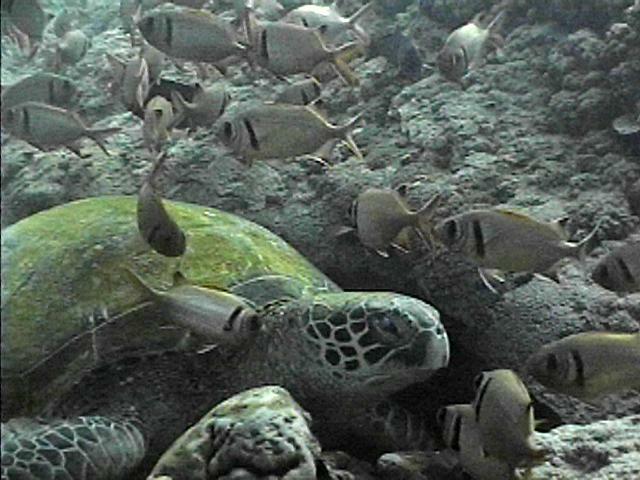 Surrounding her are clouds of lemon yellow snappers and red soldierfish. Occasionally a trumpetfish will hover over her shell while golden ring surgeons work her carapace. Anyone caught in morning rush hour traffic and facing a deadline could easily envy her life. When it is time for air, however, the spell is broken. She turns to look at you and your eyes meet. Her eyes have tumors. Yesterday we completed our 59th dive of the summer. It is just so discouraging here. We have seen more recruits/youngsters than ever before and you might think that should be good news. For us it isn't. Any young turtles arriving in our area quickly get fibropapillomas. Last year's youngsters now show the distinctive white spots in the posterior of both eyes that have become harbingers of the disease. Worse, youngsters whose shells have barely had time to foul with algae show those white spots. All are at the same location--in the eyeball just anterior to the linking tissue of the eyeball and the outer canthus. Youngsters, older turtles all the same. The first visible tumor is in that location in the eye. Why? Our favourite and most special turtle has something funny happening in the same location of her left eye. She has allowed us to get a macro-photo of this, just four inches from her eye. We are trying hard to be objective and just recording tumor "progress" on the animals we have known for years but it is hard to stay cool. The youngsters gnaw at our hearts. They are the most friendly and engaging and active and fly in our faces and sometimes get in the way and you grow to love them and yet already they have the white eye spots. The disease just eats them up and spits them out in as little as two years. So far we have sighted about eight adult males of which seven have tumors. During copulation they nip the back of the female's neck and there is prolonged contact. Can the disease also be transmitted in this way as well? And every summer we see large tagged females that we think are just stopping along their migration route. If they "meet up" with one of the Boyz, is this yet another way for the disease to be spread around the islands? There is another thing we don't understand. Some turtles have been tumored for years with very little change and have survived. For others, the tumors have exploded all over their bodies and done them in a matter of two seasons. Why? Finally, to the scientists working on fibropapillomas. We think about you a lot and wish you inspiration and progress. If funding came from wishes, you'd have all you needed.